You love your dog, and you will do anything for your dog. You buy your dog the best food, toys, accessories, and clothing. You get him or her regular checkups, go to the dog park, and spend a lot of time together. In many ways, you love your dog like a child, but unlike children, dogs cannot speak. Well, dogs cannot talk with words anyway. It also seems like the days where technology translates your dog’s barking into words you understand are far off. So, until then, you have to rely on your best friend’s body language to tell you what they need. Sometimes, as well as you think you know your good boy or girl, understanding what they really need can be difficult. Below are five things your dog is trying to tell you that you may not be aware of. We often think of dogs being comfortable when they let out a big sigh and lay down to rest. While this is true, if your dog has their tail down, ears up, head up high, mouth open, tongue slightly exposed, and a loose stance, your dog is saying “I am comfortable.” This means your dog feels no threat at this moment. When dogs find something of interest, they will let you know. Their tail may be horizontal or move side to side and their mouth may be closed. They may also slightly lean forward on their paws and have their eyes wide open. This means Fido is trying to catch a sound. It could be the mail carrier, something in the other room, or another dog barking in the distance. If you see your dog with their body lowered, hairs raised, ears back, pupils dilated, nose wrinkled, lips curled and the corner of their mouth pulled back, and tail tucked with little movement, he or she is afraid. If you see your dog doing any of these, act fast and remove the stimulus that is scaring your dog because it could lead to aggression. Like in humans, anxiety is normal in dogs. But it is not something you want to see often. An anxious dog could have separation anxiety or some other anxiety that is chronic and needs care. Anxious dogs usually have their ears pulled back and forehead smooth. They may also have brief and direct eye contact, the corner of their mouth pulled back, their tail down and wagging slightly, a raised paw, and sweaty footprints. These signs tell you your dog is anxious and needs your help to relax. Any dog owner loves to play with their dog. Sometimes dogs will tell you they want to play. 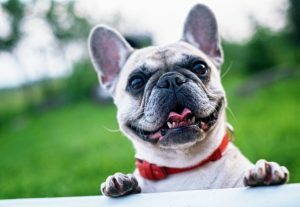 When they are in a playful mood, you will usually see their ears pointed up, pupils dilated, mouth open and tongue exposed, forepaws bent and lowered in front of them, and tail up and waving broadly. Fido may hold this only for a short time before jotting in any given direction. Now that you know the things your dog is trying to tell you, you can do something by keeping them protected while outdoors. 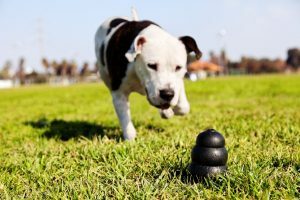 In the case that your dog sees or hears something that makes them anxious, afraid, or even playful, to the point where he or she may run off, you need a trusted way to keep them safe. That is where an invisible fence comes into the picture. These work by burying a signal wire under the ground around the perimeter of your property. You can also put them around fish ponds and flower patches to prevent your dog from going in or near them. You then place a collar on your dog that works alongside the underground wire to prevent them from leaving the garden. It does this by using a mild correction stimulus or an audio signal, which the dog recognizes, through training, as being a warning to not go any further. For those concerned, the stimulus or audio is not painful for the dog. 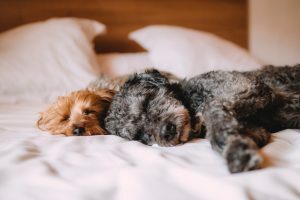 Check out our options to keep your best friend safe all year-round.